Attractive and functional front garden and driveway design. Many clients don’t think front gardens and particularly driveways really need a design to get a good job done and work out suitable details. This particular client had seen some of my previous work and wanted the same attention to detail for their front garden. They also wanted a design plan as a contract drawing to use to obtain good competitive quotations for their project. If it was possible this client wanted to create a useable sitting out area near the house which was a very sunny space unlike the rear garden. 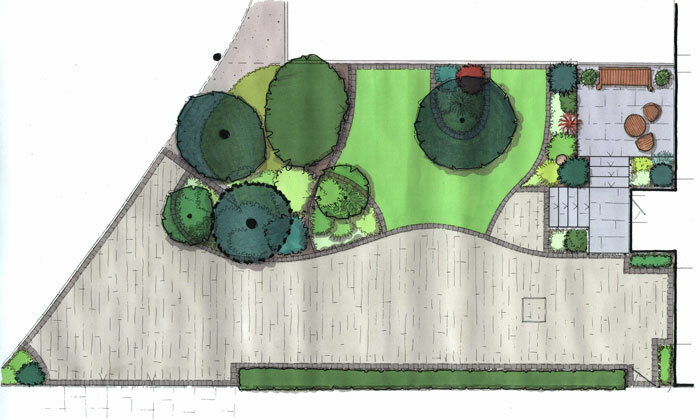 After a detailed survey of this sloping site I completed a detailed design that achieved everything they were looking for, worked well and looked fantastic. The slightly screened sit out area was a triumph of attention to detail and from there my clients enjoy looking out over their well tended front garden. The new driveway blended well into the front garden and resolved all the functional issues within an overall coherent design. As the first impression of the house for ‘kerb appeal’ front gardens need careful thought to make the most of what is often a small space with a low priority budget, but heavily influences the character of the home. Onsite parking is valuable to properties because parking is one of those subjects that is often challenging with neighbours. My client was delighted with the end result that resolved all functional issues and still achieved an attractive front garden and setting for their house.